This is what you wanted from Double Fine Adventure: A cartoony stylized world, lovingly rendered in 2D and fractured in ways that only nonsensical combinations of random items can fix. What you’re getting in Broken Age, Act 1: All of that, but with a level of cuteness, humor and heartache that’s exceedingly rare in the modern video game landscape. Nostalgia seeps out of every virtual pore of Double Fine’s latest game, spearheaded by beloved developer Tim Schafer. The game exists only because of the generosity of thousands of people who, by and large, wanted to re-capture the charms of their video game playing youth. So, it’s fitting that Broken Age looks like a gorgeously designed animated movie you can play through. 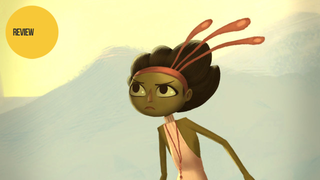 The story Broken Age tells is centered around two young people in very different realms. Out in deep space, there’s Shay, a young man pretty much held captive in a spaceship by an overprotective mother AI. In the fairy-tale hamlet of Sugar Bunting lives Vella,due to be sacrificed to a giant monster to keep her town safe, as has been donefor generations. You can switch between their stories at any time. And the desire to see how they connect—because, c’mon, they HAVE to connect, right?—will get you flitting back and forth between Shay and Vella’s quests. The vessel Shay is bound to is essentially Baby’s FirstSpacecraft but Shay is long past being an infant when we meet him. Coddled by fake adventures and excessive nursemaiding, he longs to taste real danger and real consequence.And Vella won’t go quietly into what she’s been told is a noble sacrifice. Why hasn’t anyone ever tried to kill Mog Chothra, the multi-eyed, multi-tentacled beast that inhales maidens from the communities of her world? She decides that she’sgoing to be one to do it and cuts herself out of her marzipan-encrustedsacrificial ensemble to do just that. Broken Age overflows with whimsy, enhanced by great animation, music and voicework. When star-faring teenager Shay goes out for a zero-G walkabout, his coddling on-board computer dresses him up in an overstuffed get-up with a scarf wrapped around his neck. Sealed up tight in his vacuum-proof uniform, there’s no way he actually needs it. But there it is just in case. And Vella’s travels take her to places with cranky talking trees and huckster god-beings, where Schafer and company get to gently send up image-centric politicking and saccharine new-age spiritualism. Vella’s world is like a Brothers Grimm story-setting with all the gore and cruelty bled out of it, for safety’s sake. Her single-minded desire to kill Mog Chothra can be read as asly, script-flipping commentary on the damsel-in-distress trope. She’s going tobe her own savior. If there’s any disappointment to be had with Broken Age, it’s that the gameplay lacks any real surprise. The dryly delivered gags and dialogue feel more mature—clearly scripted by someone who’s become a parent—but the act of playing the game doesn’t add any new wrinkles to the well-worn “fetch object/fuse object/say right thing” adventure game formula. The puzzles aren’tsuper-tough brain teasers and seem more designed to make you laugh than totorture your problem-solving skills. There’s a bit of gentle guidance in theform of flashing icons and pointers that indicate when you might need to use aspecific item. Conundrums—and solving them—used to be the main event inadventure games. Here, the puzzles aren’t the point. The story and the themesare the point. That’s the closest thing to creative evolution—the thing that feels the most new-school— in Broken Age, Act 1. Nevertheless, Act 1 lands dead center in the expectations of what many people said they wanted. This is a game about families. About what we inherit and what we pass on to those who come after us. It looks backward but in a way that evokes affection, not concern. The two halves of Broken Age’s first chapter show divergent consequences for breaking with the wishes of people who care for you. Down one of its narrative paths, there’s a true calling found from jettisoning what caretakers tell you to do with your life. At the end of the other thread, a comforting familial network gets shattered by the young person who chooses to stubbornly go their own way. It’s a bittersweet place for this game to plant its flag,one that has metaphorical meaning, too. Double Fine was only able to make Broken Age by breaking from traditional wisdom about the video game funding/publishing/creation model and radically re-inventing itself. The studio could’ve crash-landed after their leap of faith but they found a warm embrace instead. This game—gentle, wry and streamlined in a very grown-up way—is their way of giving a hug back to the people who play it. Note: The second part of Broken Age is out on April 28th, 2015. It’s very much of a piece with Part 1, meshing funny dialogue with challenging puzzles and mixing in a bit of melancholy, too. You can find a write-up of my impressions here.